In its early years, when the Cleveland Foundation had very little income from which to make grants, its principal activity was to sponsor municipal studies that revealed an urgent need to address myriad urban problems. Public and higher education, social services, recreation, the quality of life in central-city neighborhoods, the criminal justice system, opportunities for economic advancement, especially for new immigrants—these were among the elements of civic infrastructure that the foundation’s surveys identified as inadequate. A galvanized public demanded action on many of the surveys’ detailed recommendations for reform. The issues facing 21st-century Clevelanders—educational and economic opportunity, neighborhood and cultural vitality, and strong health and human services—are much the same as those with which earlier generations wrestled. Foundation leaders confer about how to distribute 1947 income of $614,479 to a standing list of charitable institutions and agencies. Foundation director Leyton E. Carter (third from right) is seated next to the board’s sole female member, Constance Mather Bishop. 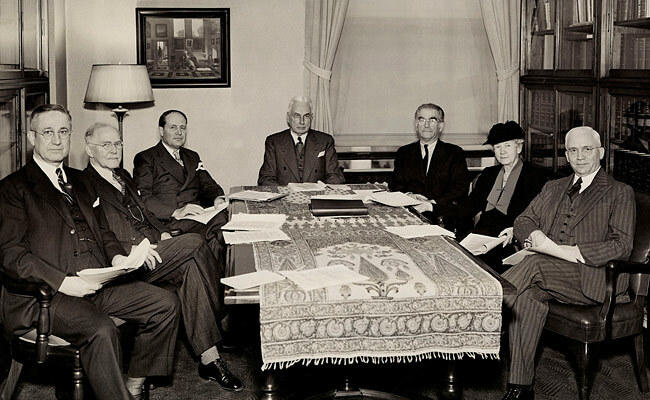 Although the foundation’s trailblazing was a faded tradition by 1955, when this picture of the trustee bank presidents holding a replica of the foundation’s logo was snapped, its stature as the world’s first community trust remained a source of pride. 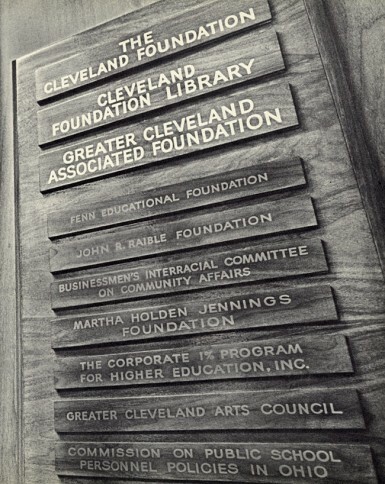 The multitude of organizational nameplates on the door to the Cleveland Foundation’s offices in the 1970s testified to its rebirth as a nexus of progressive philanthropy and an incubator of social-action programs. These calls to action would resonate with Cleveland Foundation founder Frederick H. Goff, who conceived the idea of conducting fact-finding inquiries into the community’s most pressing concerns, and with the foundation board, staff and research consultants who directed the decade-long (1914‒1924) survey work. These pioneering philanthropists had at least one thing in common with contemporary Clevelanders: a commitment to address the enduring concerns of educational and economic opportunity, neighborhood and cultural vitality, and strong health and human services. Problems recur, organizations wane and strategies falter. Subsequent generations of Cleveland Foundation leaders understood that it was their responsibility to help the community turn the emergence of unforeseen challenges into opportunities to make progress on key community issues. 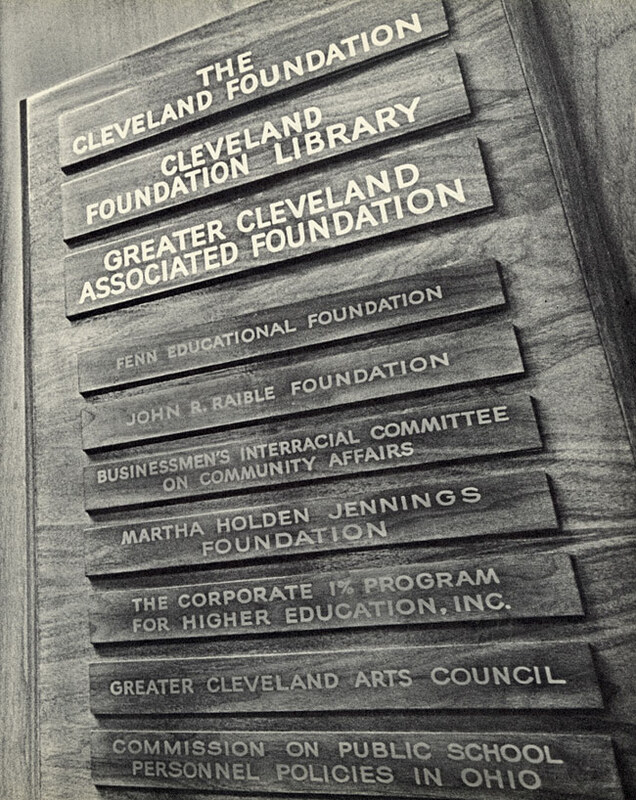 Click on the highlighted era-by-era accounts to learn about the evolution of foundation strategies for supporting the aspirations of individuals and institutions mustering fresh ideas and new energy to meet the demands of their particular time and place in Cleveland’s history.